Just when you thought you'd seen it all, here's a Chinese hospital that has come up with a gimmick to promote its service-oriented approach. 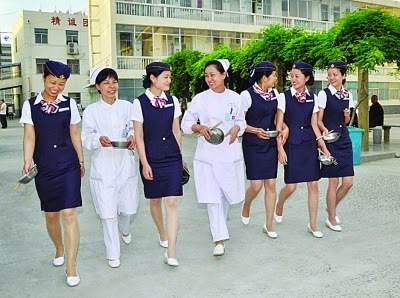 The Lianshui Huaian Hospital of Chinese Medicine has sent 12 nurses on an Eastern Airlines-style airline cabin crew training course and now requires them to wear air hostess uniforms on the wards. The aim is to emphasise the personal service aspect of the hospital's care, says hospital manager Bo Haijuan. He came up with the idea a year ago and has been doing market research about the plan, which was implemented this month. The nurses were recruited from other departments and hospitals based on age, height and appearance, and their etiquette skills were nurtured in a one-month training course. 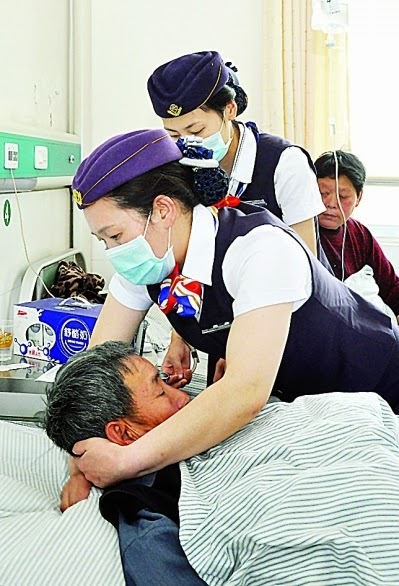 Bo Haijun says he wanted the 'hostess nurses' to stand out from ordinary nurses, who he said gave patients a 'cold face', lacked manners and had little personal caring spirit. The hostess nurses always have a warm smile and patience, he said. However, they still carry out all the normal patient care and technical functions of regular nurses. A reporter from Yangzi Evening News noted that in the hospital the nurses administered treatment such as moxibustion, but they also dealt with small service matters such as offering coffee and comfortable chairs for waiting patients. Their uniforms resemble those of airline cabin crew although the skirts are slightly longer for modesty reasons. The new nurses who spoke to the reporter said they felt more pride in their job but now had to be more careful about their lifestyle and appearance. One said she no longer dare stay up past midnight on social media because she feared having dark rings under her eyes and looking tired - now she went to bed at 10pm. Another said she had to avoid fatty food because she must keep her figure. The hospital said the hostess nurses got higher pay, but that was because they did harder work in providing service to patients.